…. 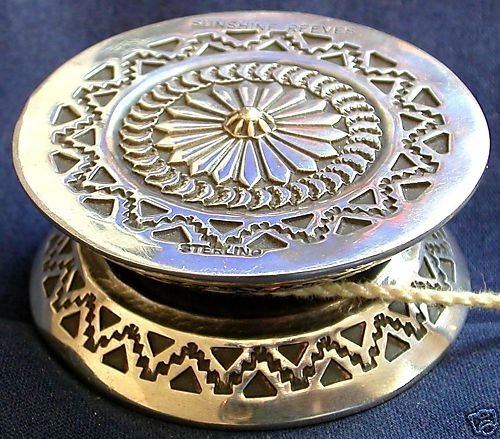 is a vintage sterling silver repousse yo-yo toy in the Art Nouveau style. Comes in original box. ….. 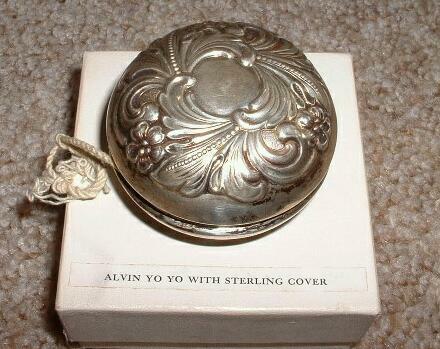 Marked on the Yo Yo, “Alvin- sterling silver plastic body”. ” Alvin Corporation- Providence, RI. Circa 1950’s. 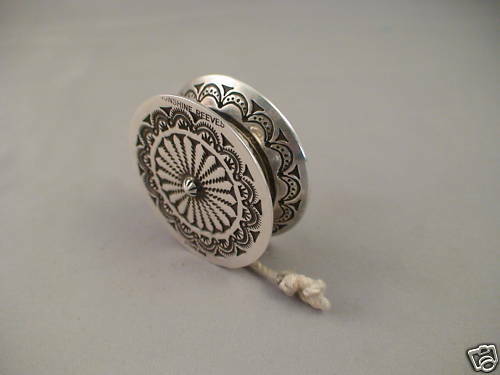 The yo-yo is measures about 2-1/4“ in diameter…..
Due yoyo realizzati dall’artista Sunshine Reeves in argento massiccio con disegni indiani Navajo. …. 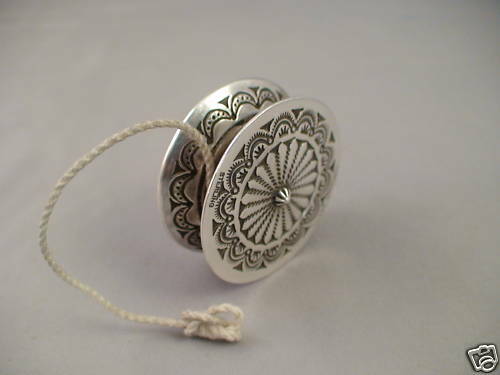 SUNSHINE REEVES NAVAJO STERLING SILVER STAMPED SIGNED HANDMADE YO-YO TOY. This yo-yo weighs 57.5 grams. 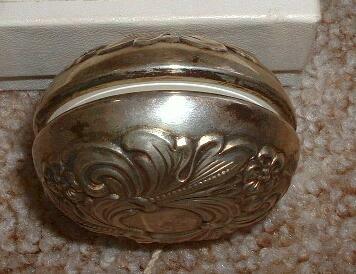 The toy on one side is 1 & 13/16″ wide in diameter. 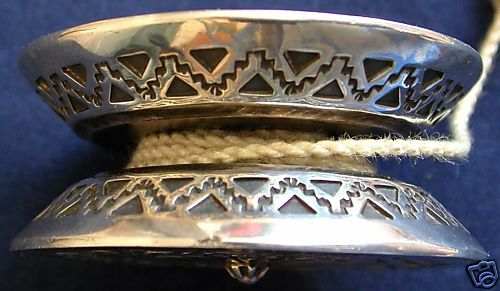 The measurement between the two side is 3/4″ thick ….. is marked and signed SUNSHINE REEVES, STERLING on one side …… on page 145 of Wright’s HALLMARKS OF THE SOUTHWEST, .. this famous NAVAJO silversmith. ….. Winner of numerous awards, including Santa Fe Indian Market and Gallup Intertribal Ceremonial, Daniel “Sunshine” Reeves is one of the star Indian jewelers of today. He is gaining fame as the creator of lifelike miniature trains created from sterling silver as well. His complex and precise stamp work is distinctive as it covers the entirety of each piece of his jewelry. 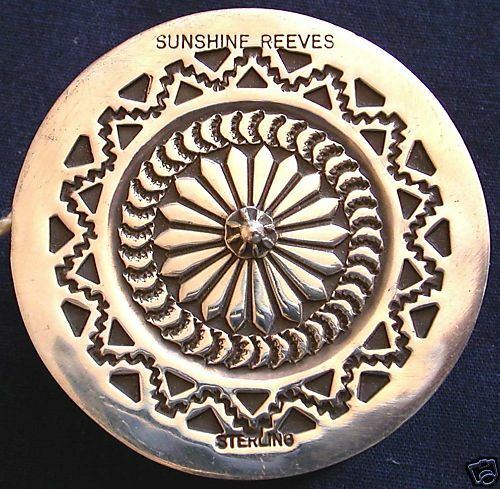 Sunshine is the younger brother of renowned silversmith Gary Reeves and of David Reeves (now deceased), who was so instrumental in teaching the craft to both Gary and Sunshine, as well as their half-brothers Darrel and Andy Cadman. Sunshine’s work, like that of his brother Gary, is present in the collections of the Heard Museum in Phoenix and he has won numerous awards for his work.